Apart from switching out the hardware in the kitchen, one of the first tasks we wanted to accomplish in our new home (which I’ve since started referring to as The White House since every.single.wall is painted white) was to switch out all the ceiling fans for light fixtures. Ceiling fans in a house with ceilings than are barely 8ft, with a husband that is 6’1”, is a recipe for disaster. 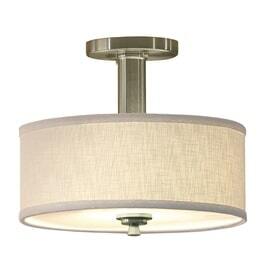 Generally speaking with lowish ceilings you have to be careful with the type of light fixtures you have. You don’t want anything that hangs too low or draws too much attention to the low height. By the way, have you shopped for lights lately? They are expeeeeeensive. Every time I found something I liked it was way out of budget. 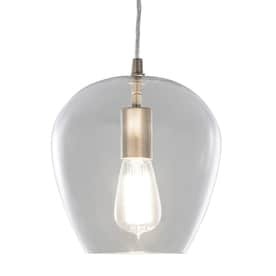 I have zero desire to spend $500 on a light. That’s money that could be going into my pink bathroom renovation fund. It took several weeks but I did eventually settle on lights for most of the house. 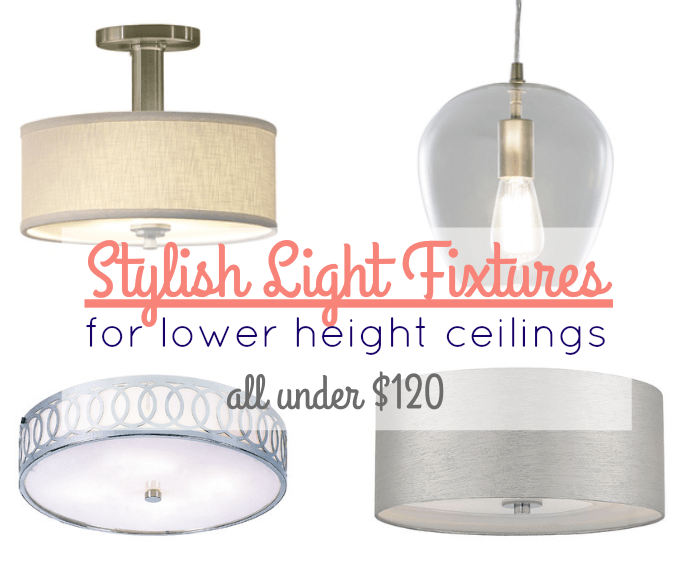 They are all under $120 and work perfectly with lower height ceilings. Let’s start with what I picked for the kitchen. Funnily enough, I also chose this fixture in our last house. It’s modern, stylish and priced well. It comes in several different sizes but I bought the largest 4 bulb size for our kitchen. 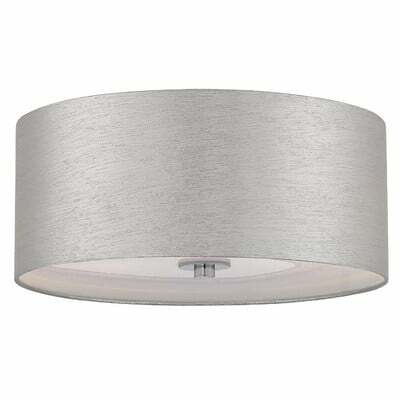 For our master bedroom, this silver thread flushmount has just the right amount of bling. I love it! For the other three bedrooms, we chose this very budget friendly semi-flushmount from Lowes. At $54 each, they are stylish and very affordable. Finally, let me share my favorite light purchase – our statement dining room light. In my mind I had pictured a grand chandelier but not a lot was working with the ceiling height. In the end I found this beautiful glass pendants at Lowes and decided that grouping three of them together would make for nice a statement piece over our table. And because they are glass, they wouldn’t draw the eye too much to the low ceiling or obstruct the view through the room. They come with those nickel Edison bulbs that add a nice fun touch to them. 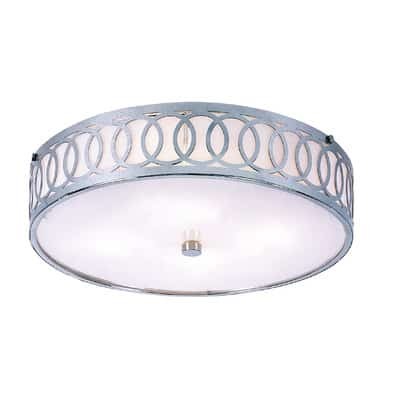 At $59 each, even three of them is much cheaper than a lot of dining room light fixtures. Slowly but surely we are starting on little projects around The White House. Now that all the lights are replaced we can move on to painting. I think I’ve finally decided on paint colors. I’m not exaggerating when I tell you that I nearly lost my mind with paint swatches. UGH!! So what are your thoughts on the lights I chose? Do you have low or high ceilings to contend with? I’m sure both have their own set of challenges! P.S. Want to replace light fixtures yourself? It’s an easy DIY! Here’s how. i like all you have chosen. for one or two, especially in the kitchen you may want to decoupage them to make them unique. i use paper napkins that i cut out the shapes and modge podge them on.so far i’ve done lamps with coordinating colors and designs, wish there was a way to attach pictures, they are really stunning. I like them all. We have cathedral ceilings in some rooms, but I do have low profile ceiling fans in the 8′ ceiling rooms, with a 6’4″ husband. We don’t have any problem. Oh I’m sure your cathedral ceilings are beautiful! I wish we even had standard 8 ft ceilings…ours are sadly only 7 ft 10 – I guess those extra few inches make a difference! !